I use a wonderful service for saving text to be read later, instapaper.com. It's gotten more wonderful as time has gone on and other applications/service's have gained the ability to save links/articles/webpages there for me to pick up later. For instance, I'm out and about checking twitter on my iPhone using tweetie and someone tweets a link. Rather than wait for it to load and having to read it then and there I can just hit "Read Later" and it's saved in my instapaper account for me to read as and when I choose to. 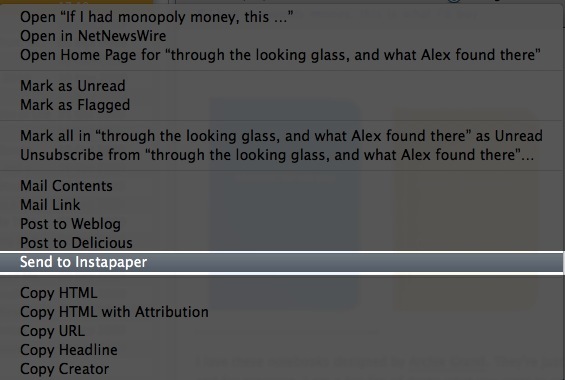 Recently the legendary mac feed reader NetNewsWire gained this ability too. 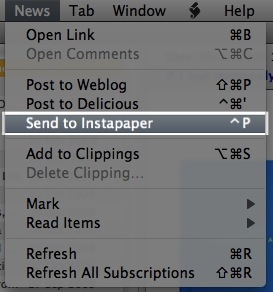 There's a few ways to send a feed item to instapaper from within NNW. Firstly you can right-click and click "Send to Instapaper". Secondly there's a menu item for it in the News menu, which also provides my chosen way of instapapering an item—the keyboard shortcut! ⌃P (control-P). So, in NNW I'm happily sending stuff to instapaper with the handy ⌃P shortcut, but that doesn't exist in the third place I mark things to read later--Safari! Up until now I've been using the standard "Read Later" bookmarklet that instapaper.com provides, and it's got a spot on my Bookmarks Bar so I can easily click it. That doesn't really help with the fact I'm hitting ⌃P in NNW, and it doesn't work in Safari. Quite often I noticed myself hitting the key combination in Safari and wondering for a split second why it wasn't sending the item to instapaper. Then the solution hit me! In OS X you can setup (and/or override) menu items with custom key combinations! Why hadn't I remembered this before. 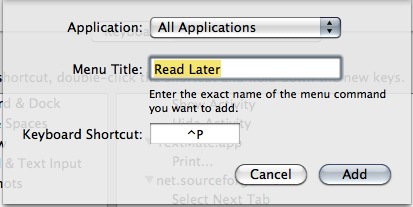 Because the "Read Later" bookmark(let) is nested under the Bookmarks menu, it is a menu item! A quick trip into the Keyboards Prefpane in System Preferences and a new binding later and voilâ, "Read Later" in Safari is bound to ⌃P and I can use it in both Safari and NNW.